Ever since I joined ZigWheels in August 2017, I’ve been at the mercy of Pune’s public transportation system. Yes, I feel sorry for me too. 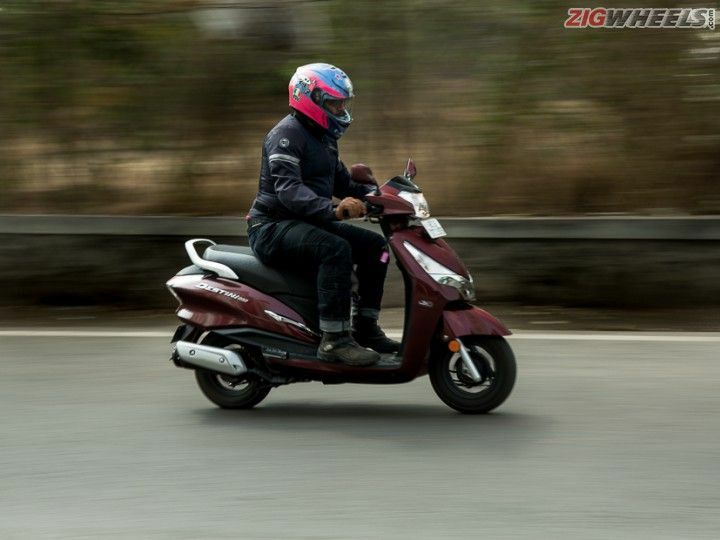 To end the suffering of my daily safar, I was tossed the keys of Hero’s latest entry in the 125cc scooter segment - the Destini 125. Now, I am not looking forward to doing hyper-mileage runs or Goa trips like Praveen and Ben on their Radeons and RR 310s respectively. What I am looking forward to doing is get from point A to point B, and tackle all the variables of Indian roads in between. It just happens that the distance between these two points is close to 20km (one way) and passes through some of the busiest sections of the city. I’ve been using the scooter for almost a week now, clocking close to 120km, and there is nothing out of the ordinary to report here. Honestly, I’d like to keep things that way - perfectly ordinary and boring. After all, that’s exactly what it’s designed for, right? However, it does have a few niggles. Take for instance its i3S start-stop system. Hero has made a lot of fuss about it. While my colleagues tell me that it works flawlessly on the company’s motorcycles, I’ve had quite the opposite experience of it on the Destini so far. Often times, the throttle cuts off right before the signal turns green. And no, it doesn’t get back up with the pull of the throttle. Instead, you have to press the ignition button while irritated riders honk behind you. Surprisingly, even after switching off the i3S system, the engine seems to just cut off while idling. But I suspect this might be an issue specific to our scooter. It’s not a deal-breaker for now. But I’ll be keeping an eye on it. Overall, the Destini 125 has been the perfect companion. I am thoroughly impressed by its 124.66cc engine. The refinement level is top-notch and vibration-free for the majority of the part. It pulls very well upto 60kmph, making overtaking manoeuvres a breezy affair. The brakes, despite being drum units at either ends, are quite confidence inspiring. With the exception of a few things, it’s honestly a pretty good daily driver. However, I’m still tempted to nick the NTorq’s keys off Kanaad. This calls for a comparison review, right? Sneers: Inconsistent i3S system, cold-start.